Manzano chiles are relatives of the hot and spicy South American rocoto pepper. Manzano chilis are used most often in their fresh form because the pods are so thick that they are difficult to dry. They are great for making hot salsas. 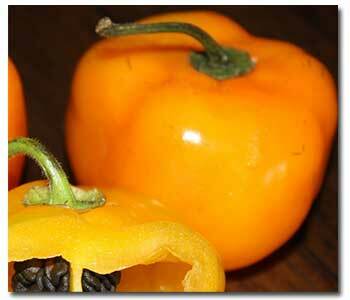 The manzano chile pepper is unusual in that it has black seeds. Its name translates to apple, and is also known as Chile Peron, Chile Caballo, and Chile Ciruelo. It is resistant to low temperatures and is generally grown at high altitudes. It turns to a yellow-orange color when reaching maturity. The Manzano pepper typically rates between 12,000 and 30,000 Scoville units on the Scoville heat index. Grow them like you would grow any pepper.